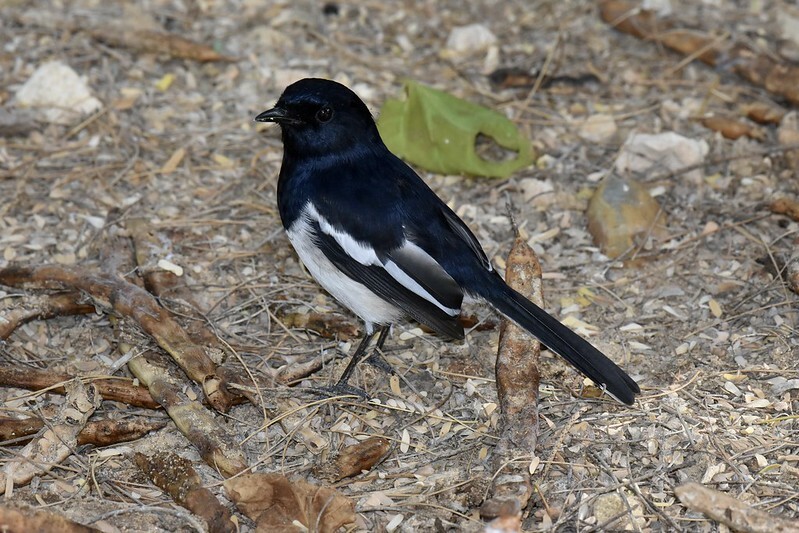 Arboretum d'Antsokay is in the arid southwestern part of Madagascar just outside the coastal town of Toliara. The arboretum contains many plant specimens from arid regions of Madagascar. It is a good place to find herps. The arboretum has accommodations and a restaurant, which is convenient for nocturnal hikes. The cottages and food are top notch. 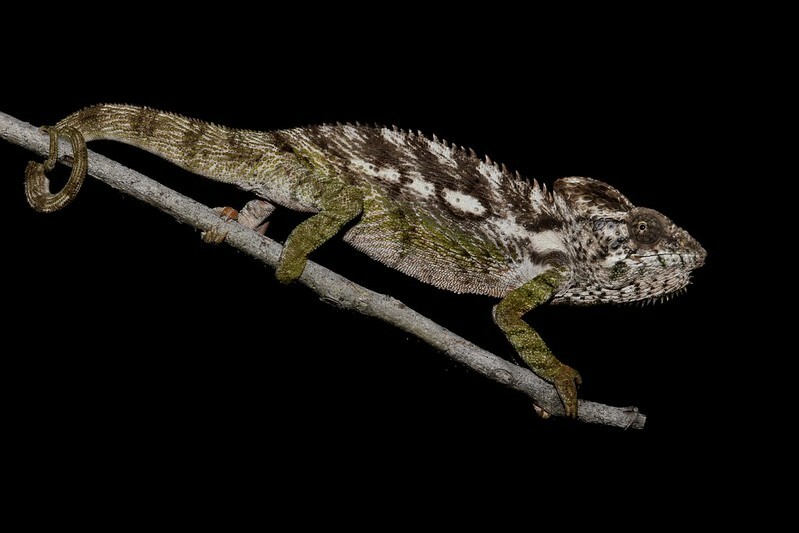 In this report I will start out with a chameleon, the large Furcifer verrucosus. 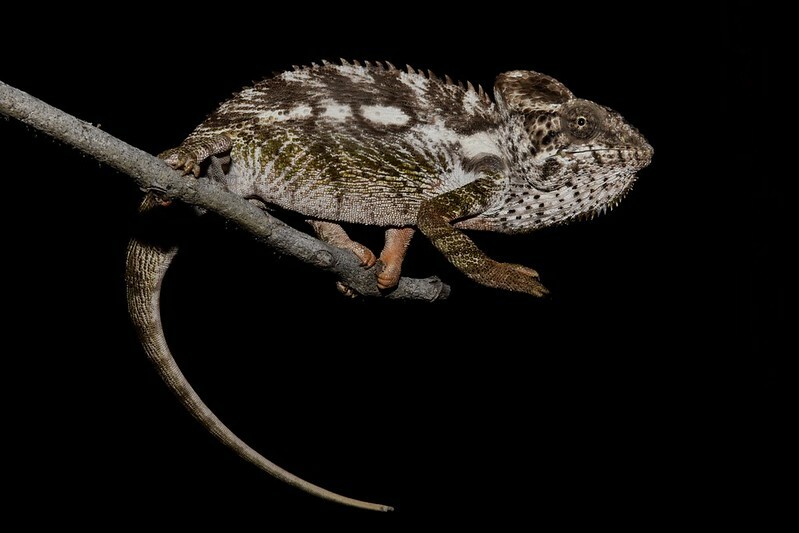 This chameleon looks similar to Furcifer oustaleti, which will be described later, and their distribution overlaps in the southwest. 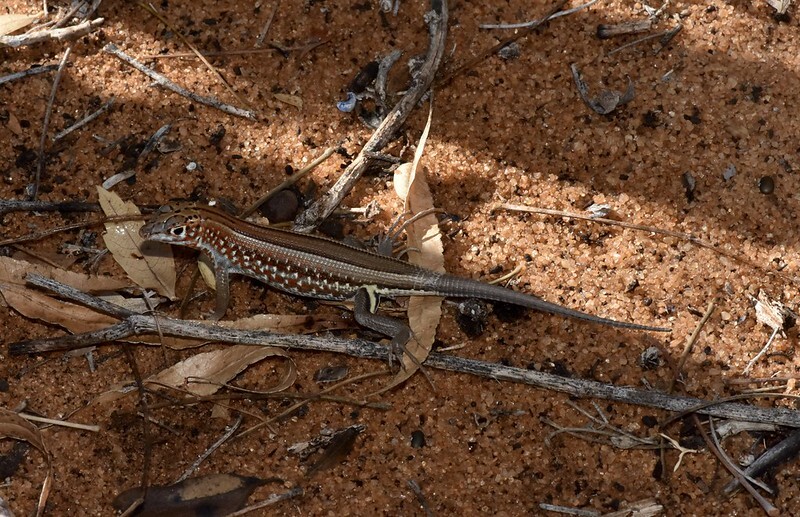 In the above pictures the chameleon is rather annoyed at me and its body and gular regions are inflated. 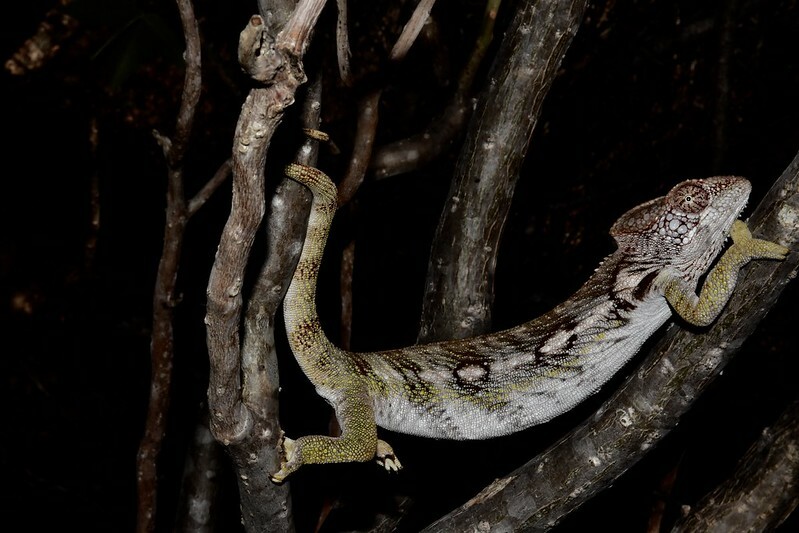 In the picture below, the same chameleon is deflated appearing much "thinner". 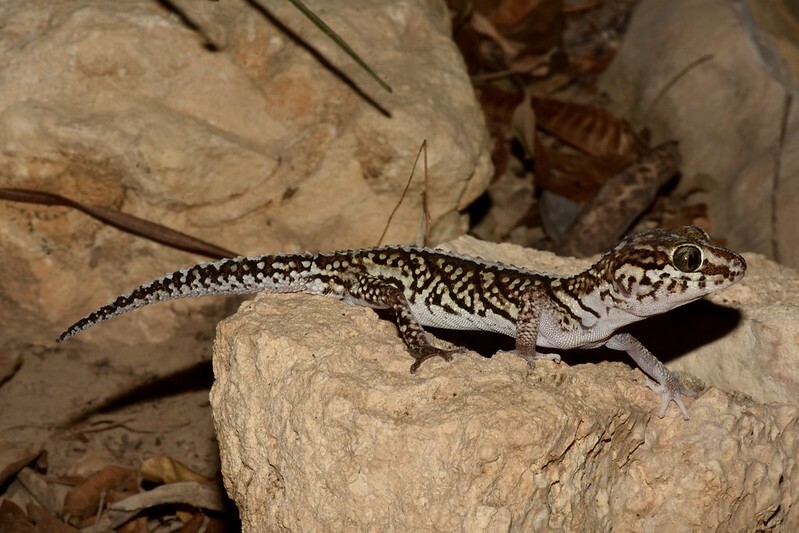 Onto the geckos. 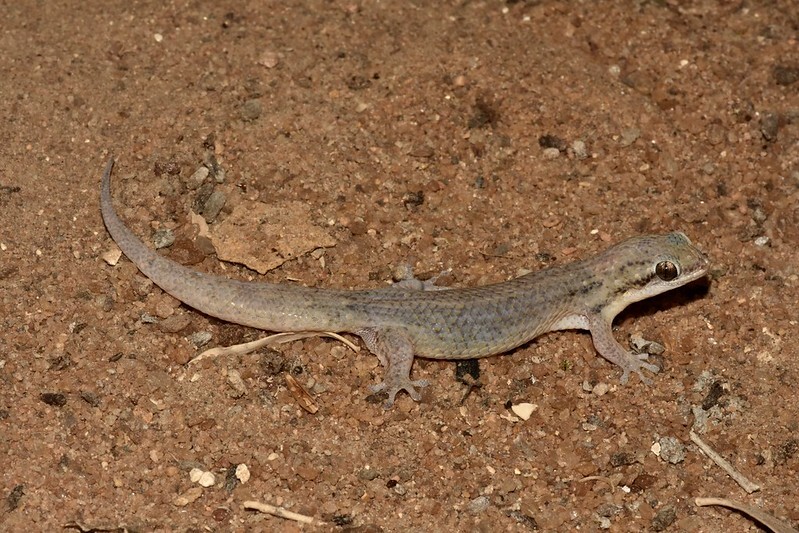 Paroedura picta is a small nocturnal gecko found in arid forests in southern Madagascar. 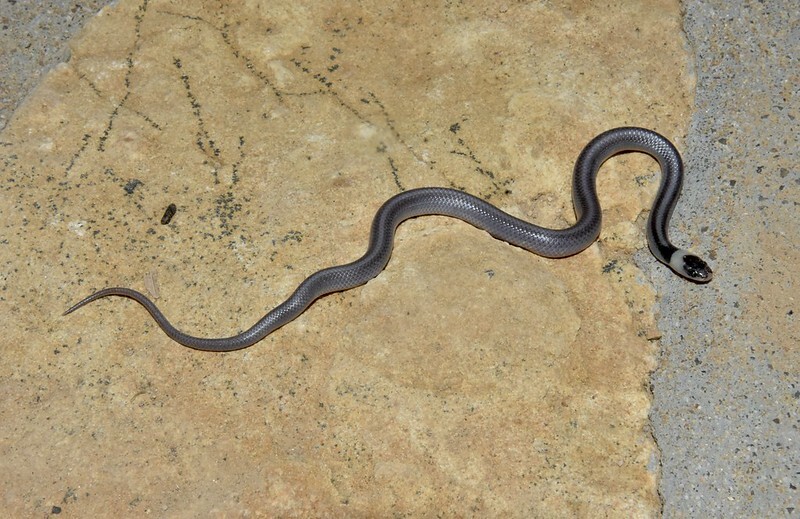 It is characterized by the diagonal banding on its body. 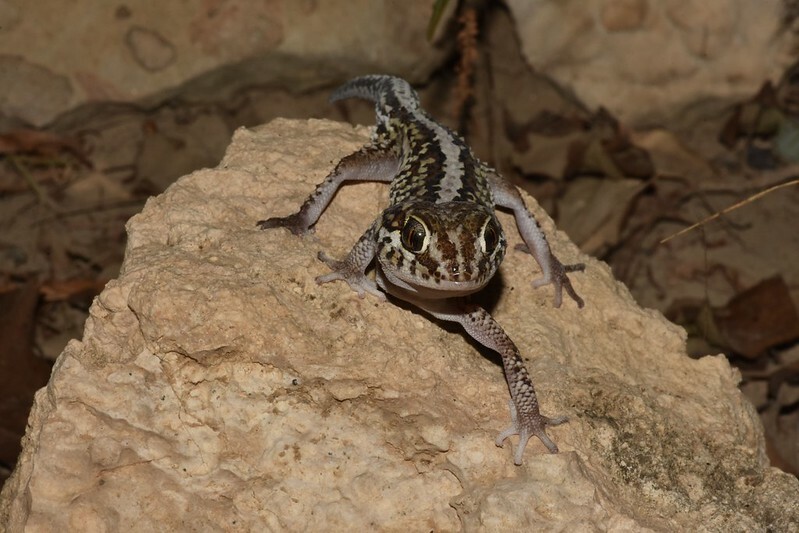 The eyes have the typical vertical pupil of nocturnal geckos. 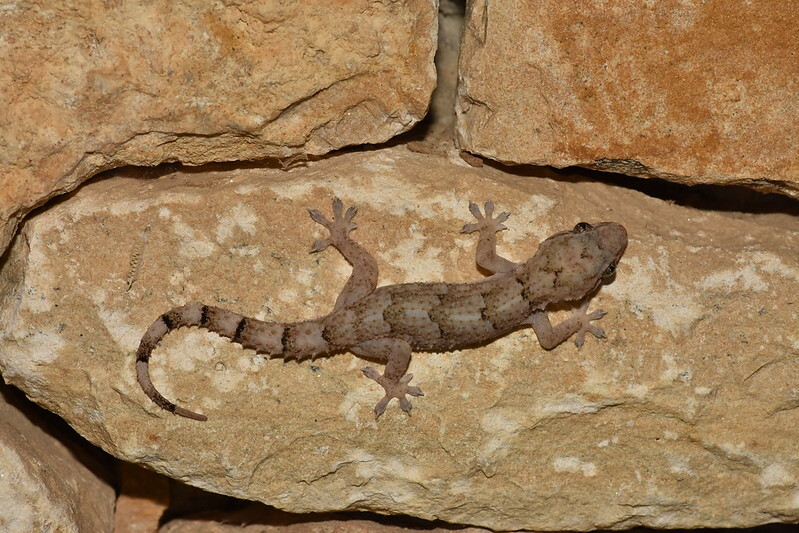 The very fine restaurant at the arboretum did not lack for non-native nocturnal geckos as represented by Hemidactylus mercatorius. 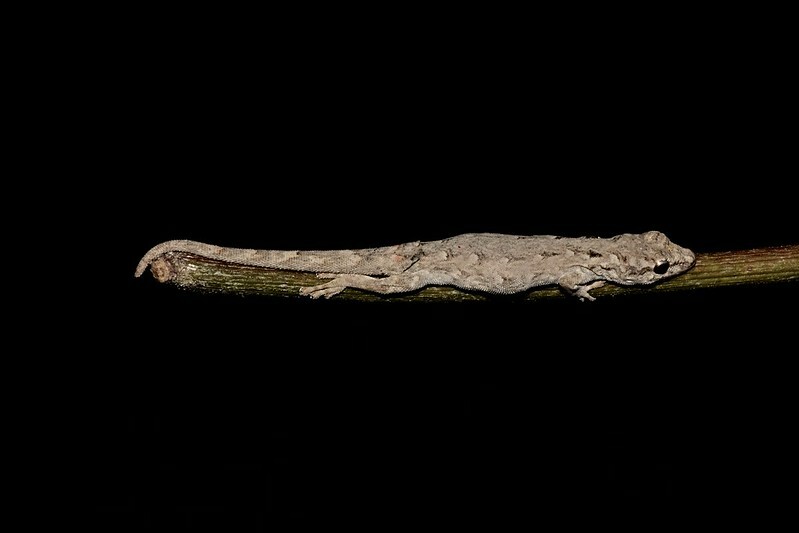 The very small Lygodactylus tuberosus is commonly associated with trees. 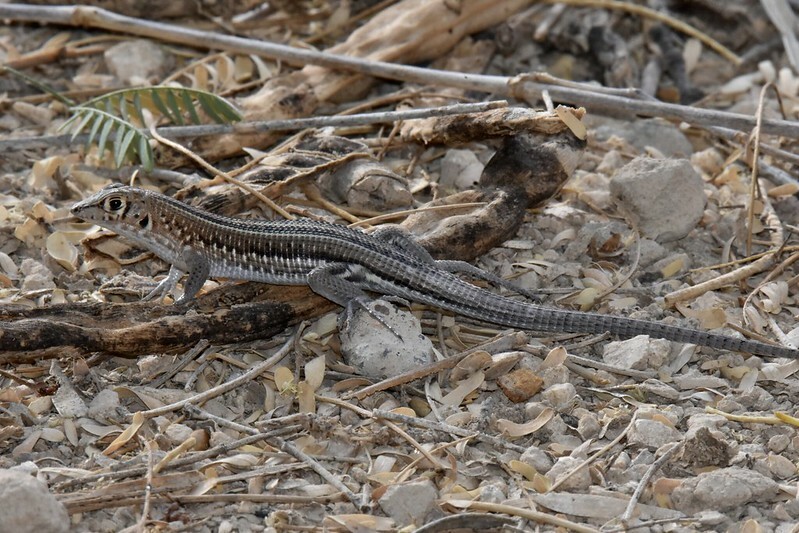 This individual appears gravid. 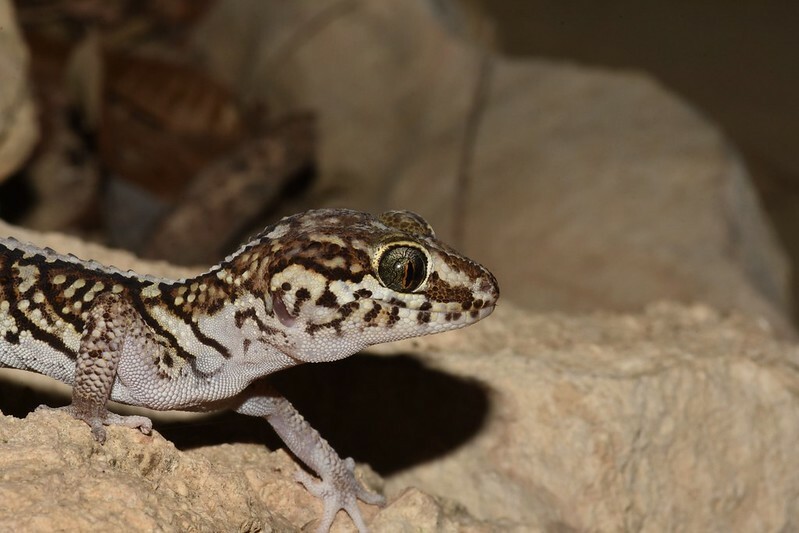 The fish-scale gecko, Geckolepis typica is capable of shedding its large scales when stressed. Luckily this did not happen to this individual during the photo session. 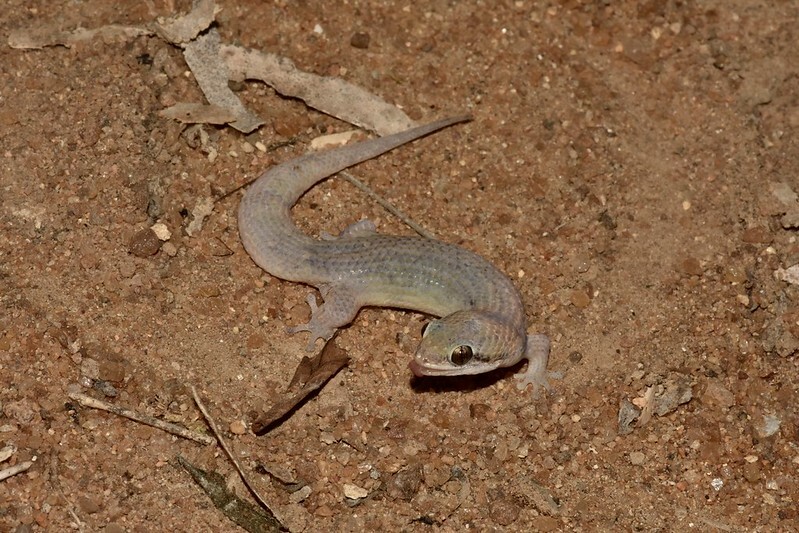 The arboretum also contained the day gecko, Phelsuma mutabilis as was also found in Ifaty. I caught this Phelsuma mutabilis licking its eye. 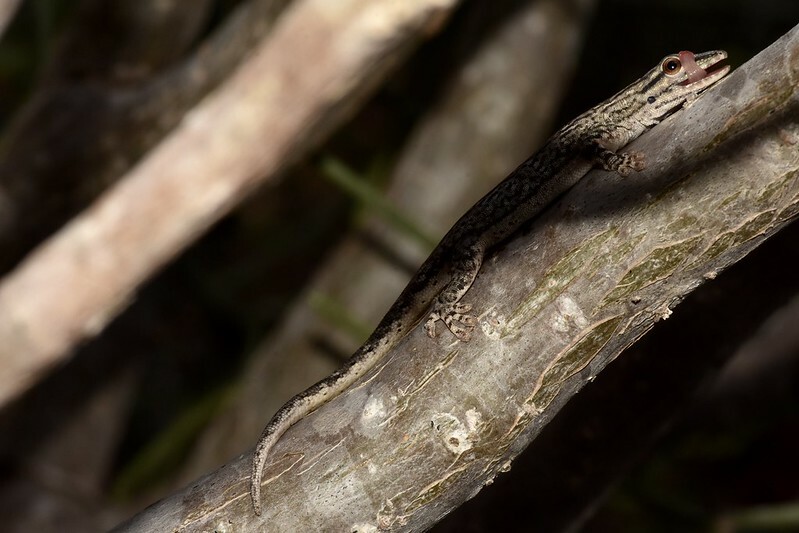 As for skinks, Trachylepis aureopunctata was found perched on a tree stump adjacent to our cottage and along the road. 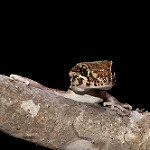 Iguanids were represented by the spiny-tailed Oplurus cyclurus posed on logs around the cottages and in the dry forest. 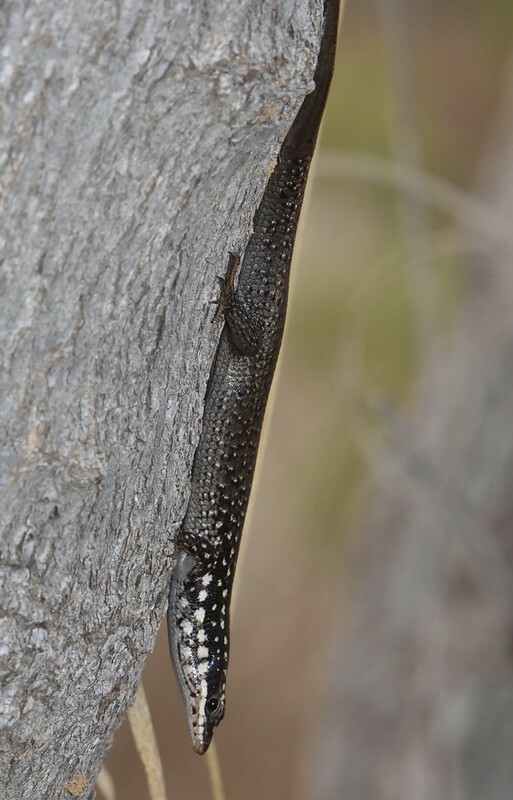 The one pictured immediately below has a regenerated tip of its tail, which is common. 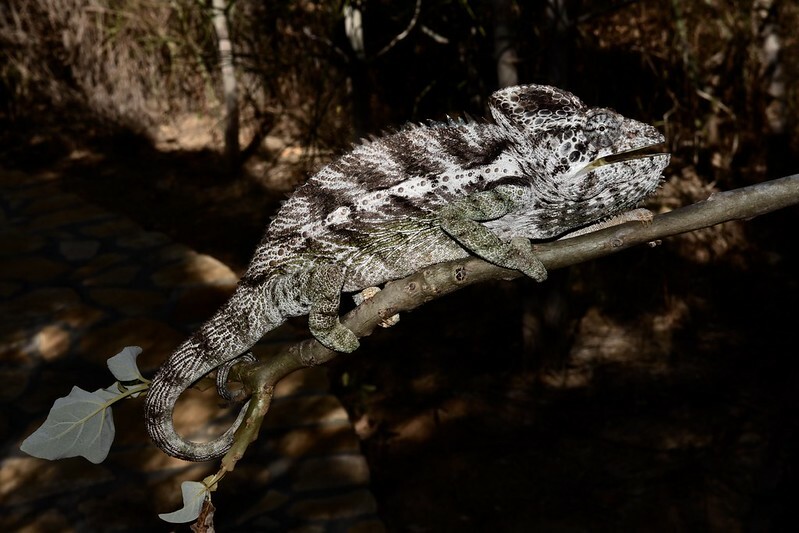 Mimophis mahfalensis was found slithering into the outdoor restaurant at the Arboretum d Antsokay. 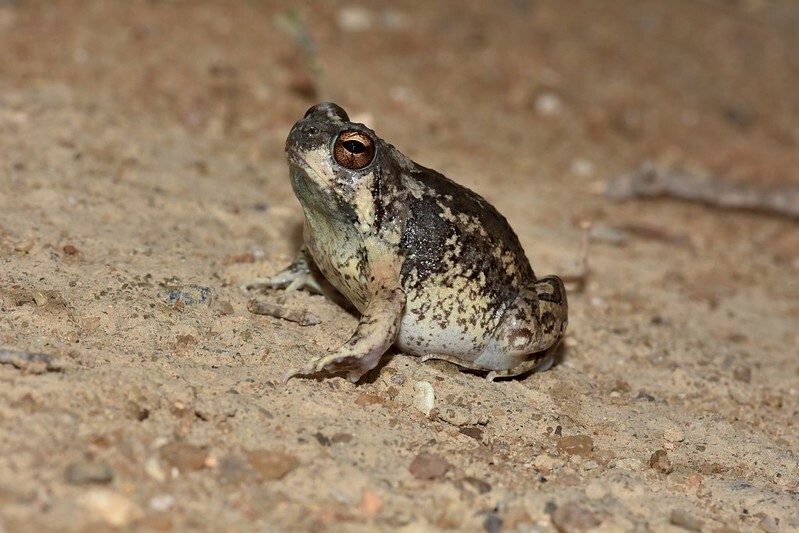 As for frogs, Scaphiophryne brevis made an appearance. 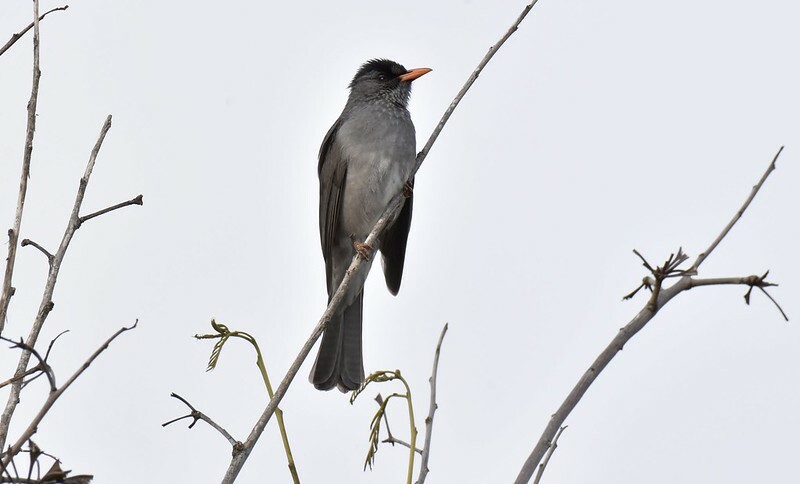 Birding was quit good. 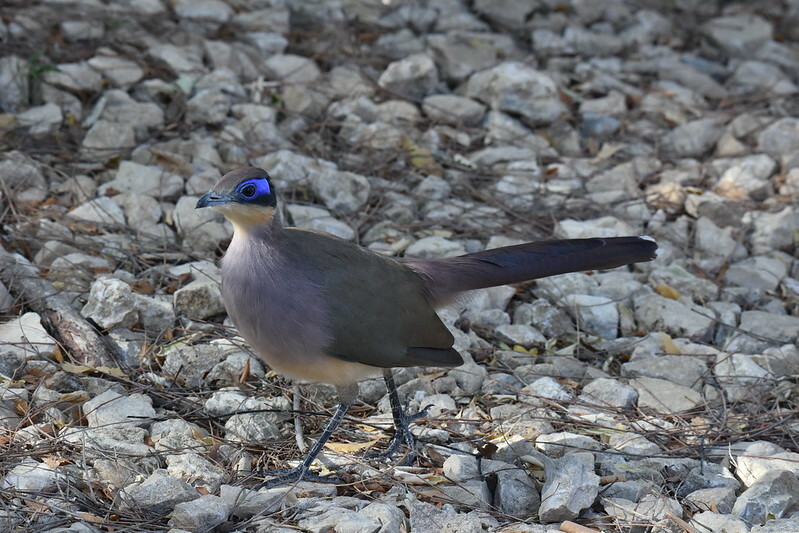 The Running Coua (Coua cursor) was habituated to the presence of humans. 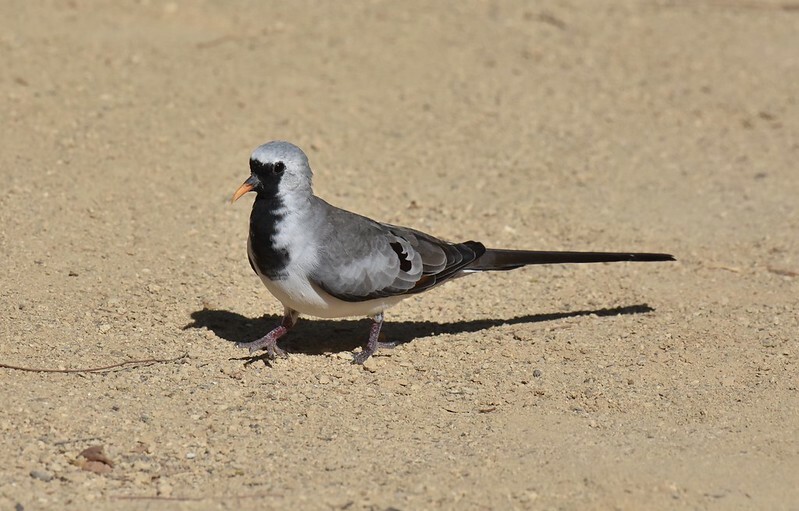 Namaqua Dove (Oena capensis), male. 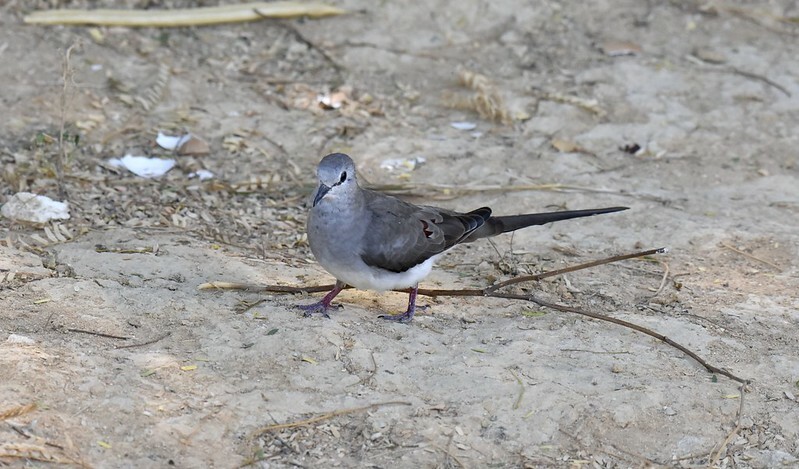 This species is sexually dimorphic. 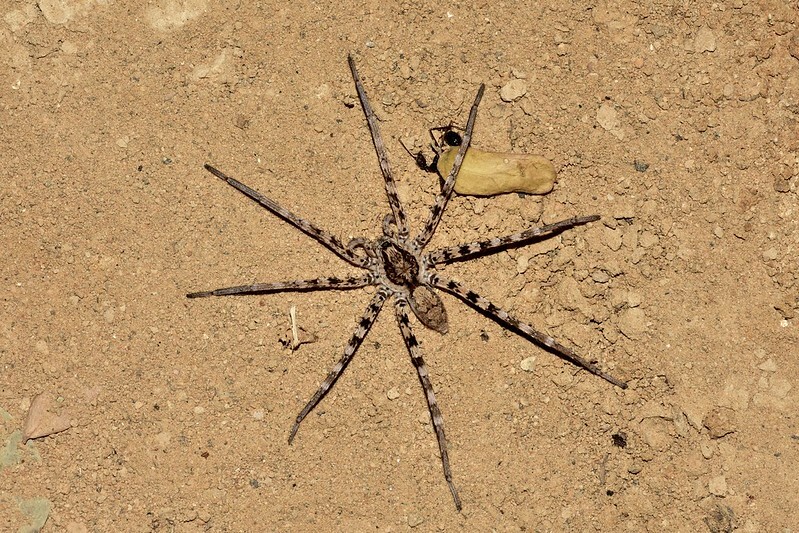 Invertebrates were represented by various species of spiders. 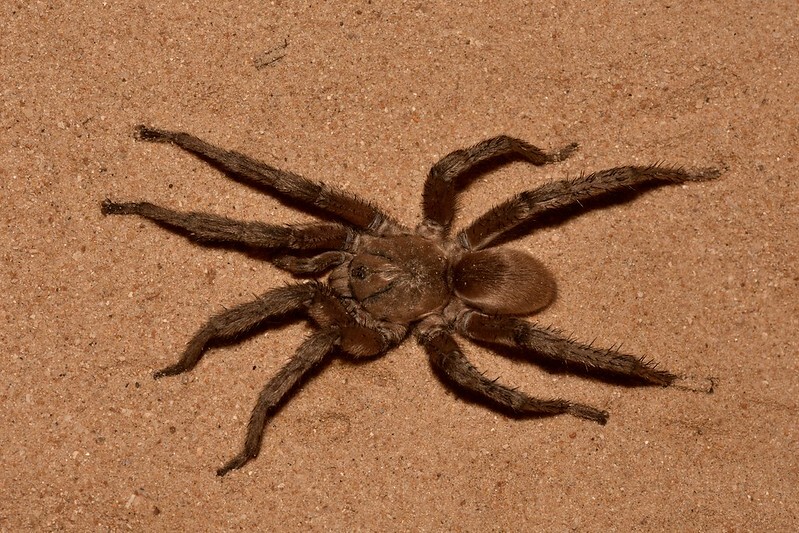 I found this mygalomorph spider on the sandy floor of the restaurant prior to our nocturnal hike. 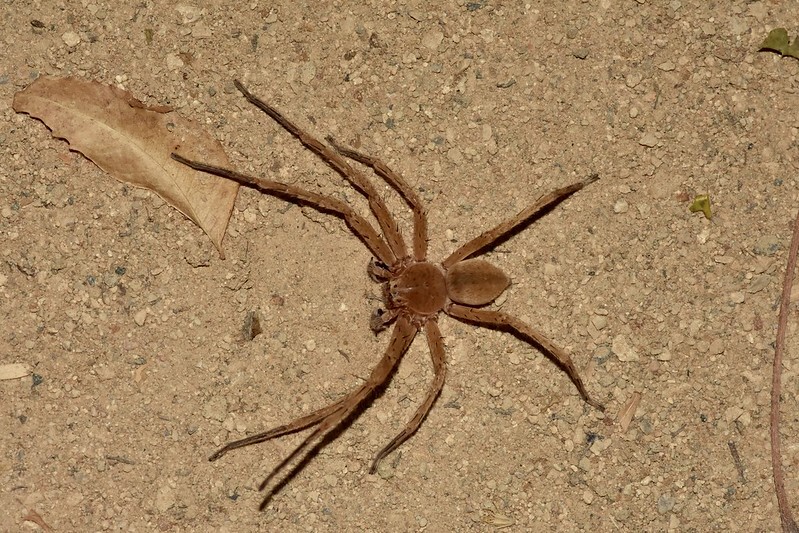 This appears to be the same species of spider that we found in the Reniala Forest. 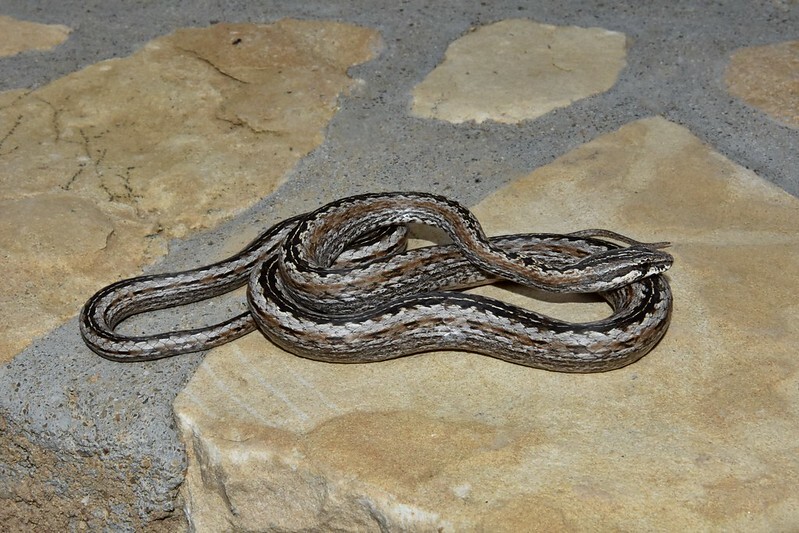 I could not resist showing it again since it has such a striking banded pattern on its legs. 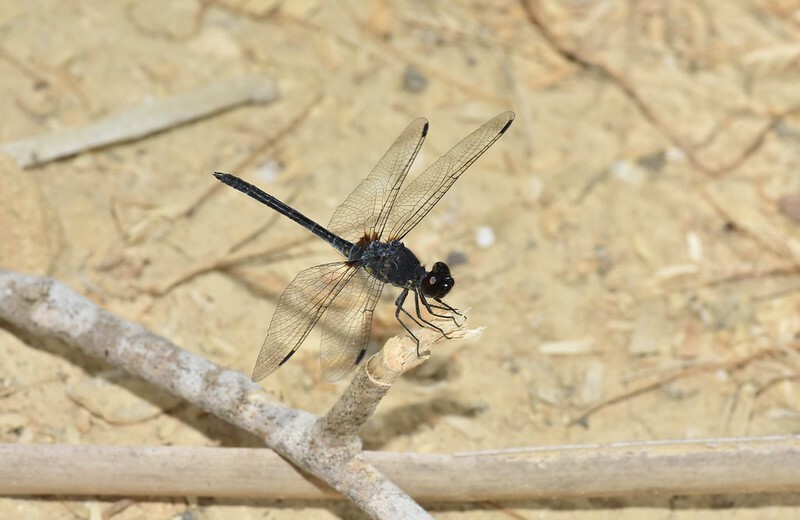 Many species of dragonflies make Madagascar home. I have not attempted to key them out. 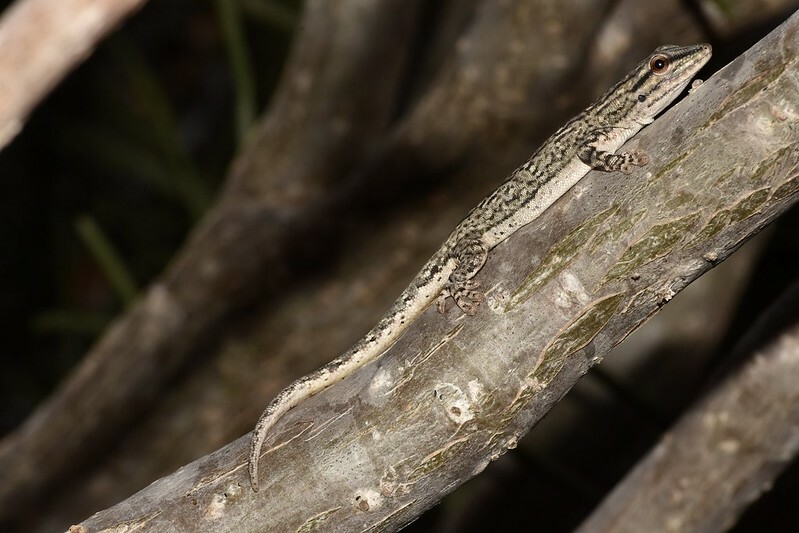 Madagascar Part 3 will cover the animals found in Isalo National Park. 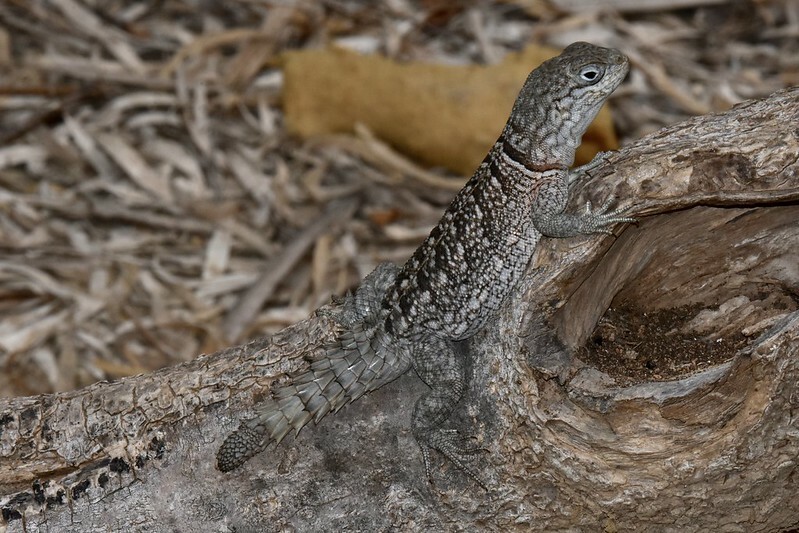 Spoiler alert: Both tree and ground boas were observed and photographed. Great photos and stories, Mitch. 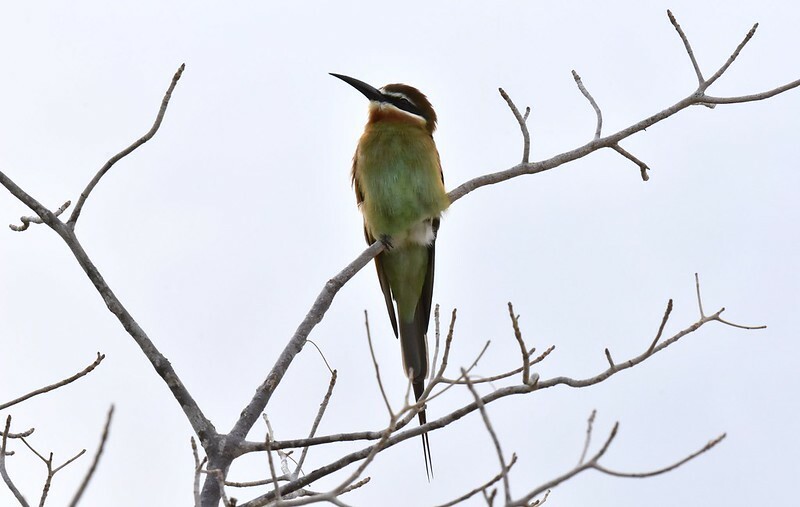 Your trip brings back nice memories of Madagascar. 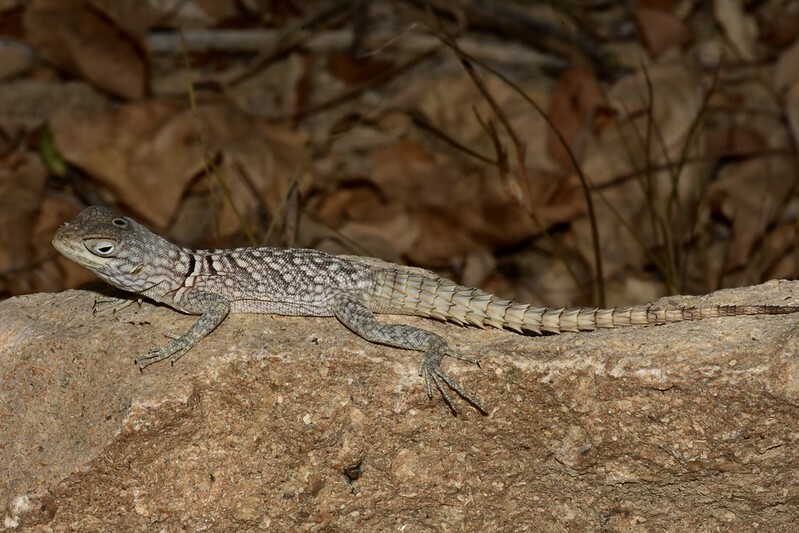 And that Heteroliodon occipitalis, is fantastic! Thanks for sharing. Thanks for your generous comments. 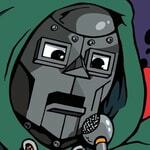 I am glad you enjoyed the posts. More are on the way.